Many websites have social media share buttons for the likes of Facebook, Twitter, Google+, LinkedIn and so on. But many website owners are not aware that they can take advantage of the image that is shared when activating the share button. And guess what, the image doesn’t have to be limited to that of the screen the user sees in front of them, although that would be the first option that many owners would think about. What if the shared page contains video? Would you want to share the first frame or an action shot from elsewhere in the movie or maybe a frame containing the video’s title screen. Maybe the page contains a pop-up box that can only be activated in certain circumstances and you want to share this action shot? You may have a message that needs to be included in the shared image and you want it to be included in the image hoping that it may go viral. 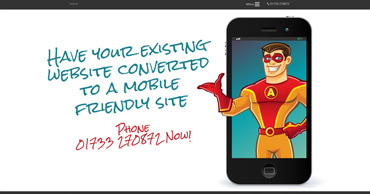 Or if it is a screen shot of the page or section of the page you may want to watermark it with your company logo. We can help you with this and ensure that your website visitors share the image that you want sharing by creating the image to your specification and ensuring that the correct code is within the page to ensure that your chosen image is used for the social media share. 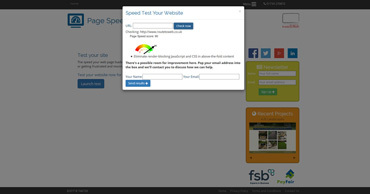 Here’s a couple of examples from this website; the first one illustrates a pop-up box used to enter a web address which is then used as reference to check and report on the page’s speed, the second is from our mobile page and shows a simple sales message and call to action. How great would this be for something similar to feature on your website? Call us now on 01733 270872 to discuss how we can integrate this into your website and ensure that the image that's shared is the image that you want sharing!